A Junk-Foodaholic's Journey to a Healthy Lifestyle: Hello. My name is Laura and I'm a Junk-Foodaholic. Hello. My name is Laura and I'm a Junk-Foodaholic. OMG girl!!! Were we seperate at birth???? LOL Really I completely know where you're coming from. I'm still very young and I feel as if I've been on that roller coaster my entire life. Like you I had my thyroid checked out and it is always normal. For a while I was doing every diet possible and instead of losing weight I gained weight....so be thankful you could at least lose the weight when you tried to eat properly. Just this past year did I start to lose any weight. I started the South Beach diet and lost 30 lbs, but sad to say...I again have gained the weight and am thoroughly disguested with myself. I'm so glad I read your post. I've been trying to "psych" myself up to get back in the saddle again. I think you have inspired me...so thank you. Congratulations on walking out your journey! I pray the Lord continues to give you the strength and wisdom to continue your walk. Wow, you've lost alot of weight and gained alot of weight in such short amounts of time! I can relate with the weight gain during pregnancy. I gained 70 lbs. with my first son. It took me two years to lose a little over 100 lbs. (I was a size 14 when I got pregnant and delivered at 253 lbs). I'm pregnant again and am gaining more weight than I wanted and am a little hard on myself. I can't wait to breastfeed again, because I want to kick start my weight loss. I did weight watchers while I was breastfeeding and they have a great program geared to breastfeeding moms. They allow you more food, dairy products, etc. to make sure your milk supply isn't affected. I loved it! I also started doing Taebo with Billy Blanks and fell in love with that exercise because it was exciting and challenging. So I thank Taebo and Weight Watchers for all the help. I even ended up appearing in his recent Taebo video, T3, because I got to meet him and told him about my weight loss right before they planned to film. Anyways, enough about me. I wanted to say that losing two lbs. or more per week seems to me like alot. I always shoot for one pound per week, unless of course I'm breastfeeding and you know how that goes. I've just been touched by your story and don't want you to yoyo anymore. Bookieboo - Thanks for the nice comments. I don't want to yo-yo anymore either. That's cool about you meeting Billy Blanks and appearing in his video. Don't be too hard on yourself regarding weight gain. Just take care of that little baby. You'll lose the weight... that I'm sure of. Wow, I can relate. 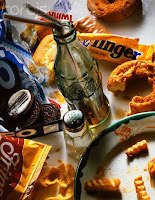 I love(d) junk food, but it does not love me. Got type 2 diabetes and now working hard to get rid of it thru a raw food diet and exercise. Laura, I am looking for inspiration. I am 26 years old and I have struggled with my weight since junior high. I have never been obese but I have always struggled to lose anywhere from 5 to 20 pounds. Two years ago, I was down to 122 from a previous high of 148. I felt great! I told myself that I would never let my weight creep back on me BUT it did. I am now 136. I am very active. I exercise at least 5 times a week however I am an emotional eater. Right now I am in grad school and the stress of being single, away from family and studying is wearing me down. Food is my only comfort yet it is making things worse. I have a horrible image of myself right now. I just feel like giving up. I shopped for interview clothes today and I just wanted to cry in the dressing room. I am so sick of this battle. I feel like I will never win.